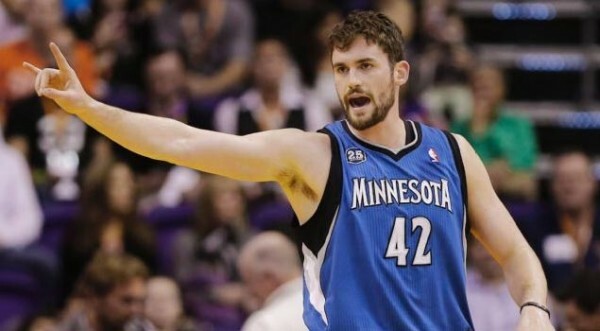 Putting up impressive numbers year after year doesn’t translate into team success as the Minnesota Timberwolves have failed to make the playoffs despite Kevin Love for the past few seasons. It seems that not being able to take things to the next level has led Love and his reps to start looking for a trading partner, and threaten the franchise to come through with such a move unless they want to lose him in free agency a year from now. Love has two more seasons on his deal, but one of them (2015-2016 season) is a player option, which he is very likely to decline. The Timberwolves, despite early season expectations for the past three years (Especially since Ricky Rubio joined the team) have missed the playoffs for 10 consecutive seasons, six of them with Love. After been promised that the team will do anything possible to assemble a better crew around him, Love seems fed up with being an All-Star and dream-team member without being able to contend for titles or even play in the postseason. Not that it’s not on him, at least somewhat. Love did average 26.1 points and 12.5 rebounds last season, impressing everyone with his full court bounce passing, vision and 3-point shooting that’s quite rare for a big man. But Love is also an awful defender and like his entire team, quite useless in clutch situations more often than not, taking the wrong shots and making very bad decisions. However, Love is a star in this league, and wants to be a star who plays more than 82 games each year. For that, he needs a team that makes the playoffs, and while the Timberwolves looked like that in 2012 until Rubio got injured and seemed to be simply in the wrong conference this season along with their fourth quarter collapses, the April-May basketball has been eluding him, and might continue to if he doesn’t change teams. Love’s representation has been telling the Timberwolves to start looking for a trade. He’d love to go play for the Lakers or the New York Knicks, but the bottom line is this: Love wants to be out of Minnesota according to the rumors, and if not this season, he’ll simply opt out of his deal in the summer of 2015, and leave the Timberwolves without the second best player that has ever played for the franchise, walking away for nothing. What should Minnesota do? Being a place that doesn’t exactly find it easy to attract top talent through free agency, losing Love is going to be a big blow. This isn’t the Josh Smith case which actually improved team chemistry by leaving the Hawks. It’ll be hard to find teams willing to take Love (and his $15.7 million cap hit) right away, but plenty of teams would love a rebounding machine that can stretch the floor and score from almost anywhere. It might simply take some time to actually complete such a deal.